Soak chickpeas overnight in water. Pressure cook and keep aside. Chop onion and green chilli. 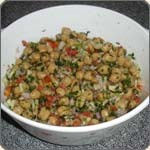 Add chickpeas, potatoes, tomatoes, chat powder, lime juice, coriander and salt.